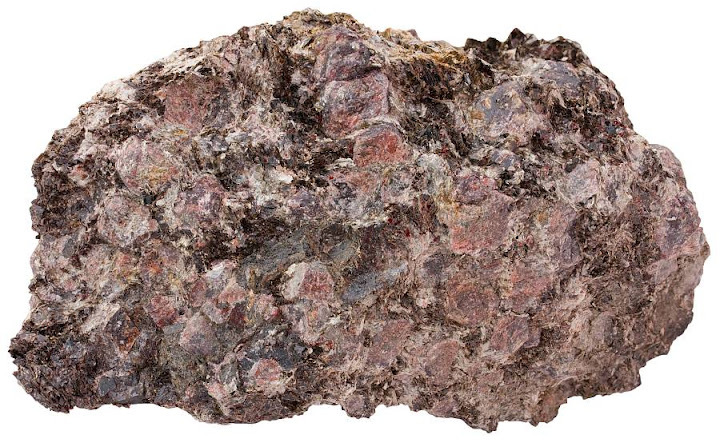 Garnet is a dense and hard silicate mineral which occurs in many rock types, but it is especially common in some metamorphic rocks like schist and amphibolite. 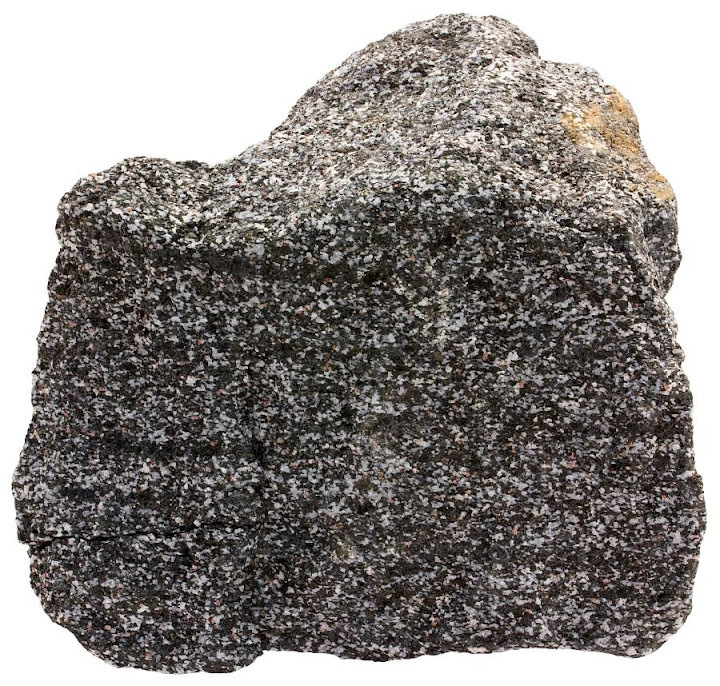 It is a common rock-forming mineral in some igneous rocks. Crystals are usually reddish and isometric. These almandine grains are picked from a beach sand. Redondo Beach, California, USA. Width of view 10 mm. 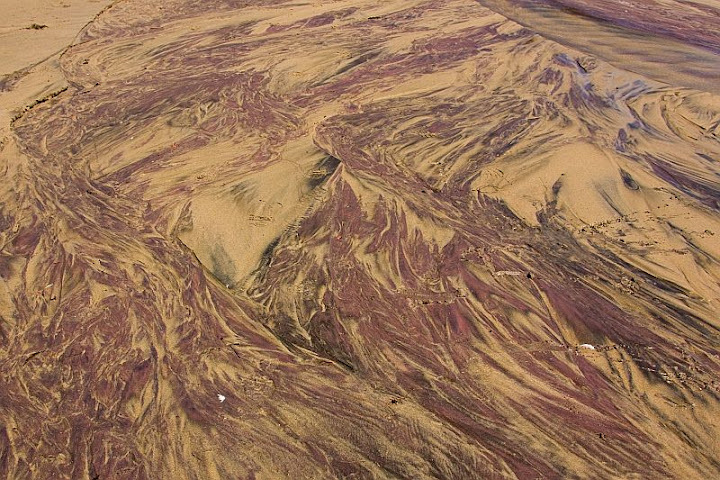 It is hard and resistant to weathering which makes it a very frequent component of sandy sediments. 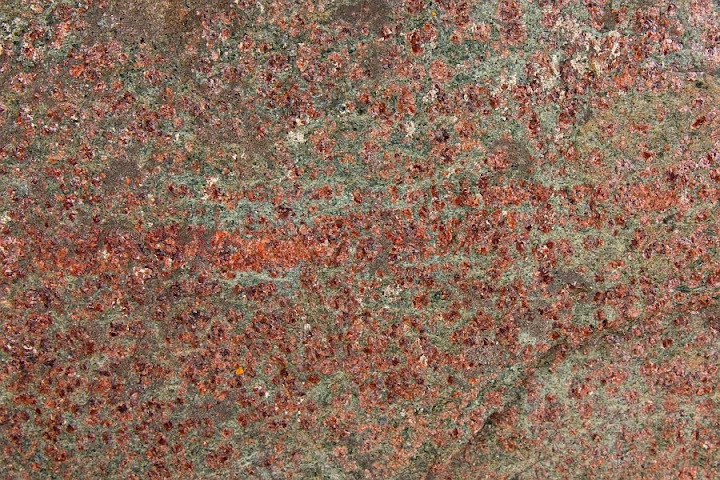 Garnet is almost nowhere a dominant mineral (it is one of the principal minerals in eclogite), but it is present in variable amounts in a wide variety of rock types and sediments. 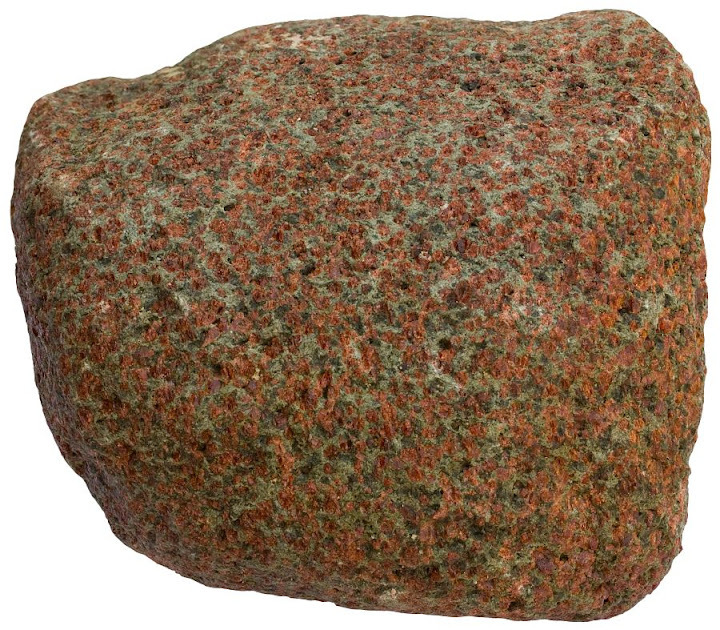 It is easily noticeable because of intense and contrasting coloration (mostly red) and because it often stands out from the surface of the rocks. Garnet is actually a mineral group, not a single mineral. These minerals share similar crystal structure, but they have a variable chemical composition. The general chemical formula is X3Y2(SiO4)3, where X cations are mostly Fe2+, Mn2+, Mg, and Ca and the Y cations are Al, Fe3+, and Cr3+. Garnets are divided into two groups.Those with Al in Y structural site are the pyralspites and those with Ca in the X site are ugrandites. These strange names are derived from the first letters of the single minerals in these groups. Pyrope, almandine, and spessartine make up the pyralspite and uvarovite, grossular, and andradite are the members of the ugrandite group. Pure endmembers, however, are very rare. There is an extensive solid solution within pyralspite and ugrandite groups, but only limited amount of substitutions are possible between these groups. Hence the need to separate them into two groups. 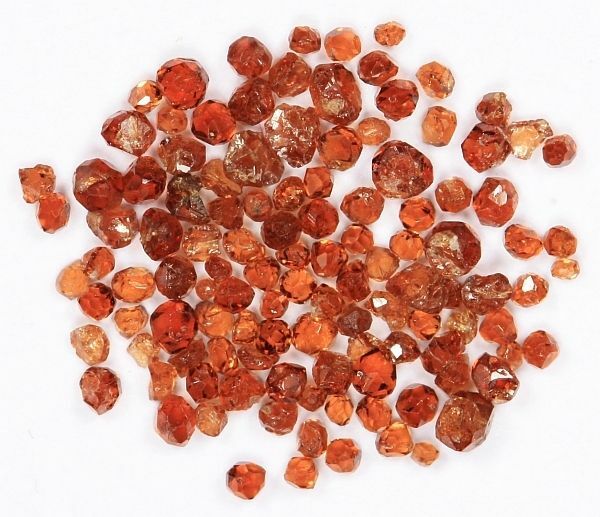 Specific name of a garnet group mineral depends on the dominant cation. It is an almandine if Fe2+ is the main cation in the X site. Almandine is the most widespread mineral of the group. 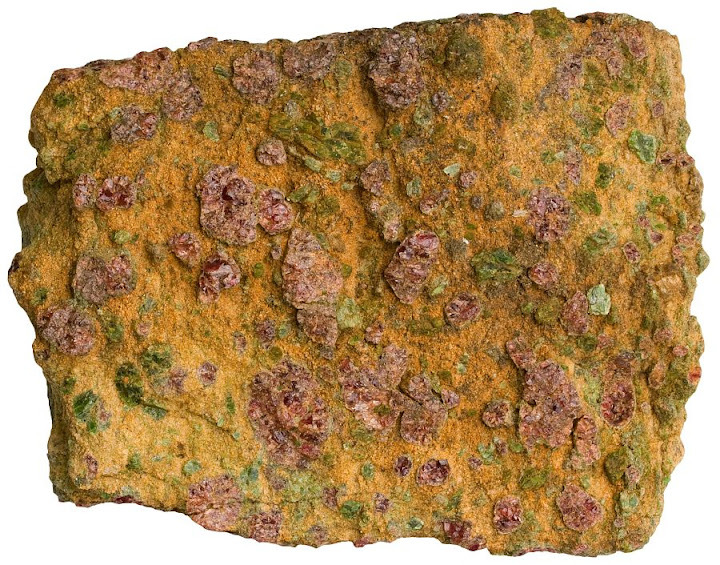 Uvarovite is commonly described as a common garnet group mineral although it is rare in nature and occurs only in specific chromium-rich rocks. Possible replacements in the lattice are not restricted to those mentioned above, but these are the most important ones. Almandine is a common mineral in metamorphic rocks that formed when buried in crust under the load of at least 10 km of rocks and sediments1. 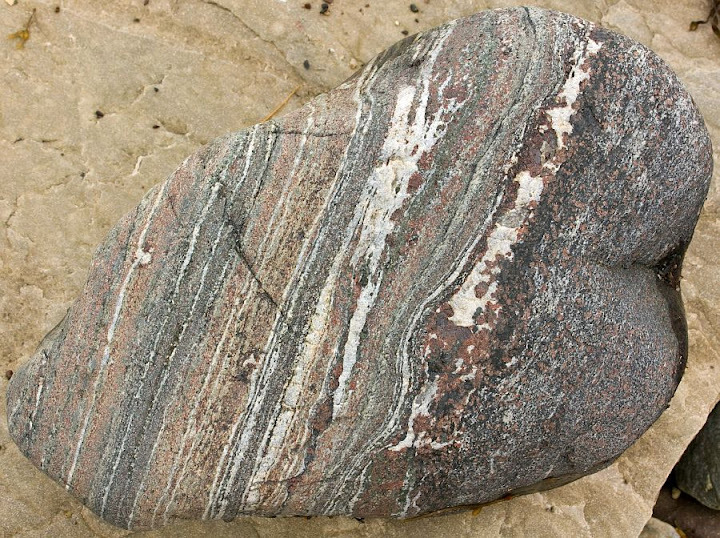 This rock sample is a schist (metamorphosed clay-rich sediments) that contains many common Al-bearing porphyroblasts like almandine (red, equant), staurolite (dark, elongated), and kyanite (light blue, elongated) in a light-colored groundmass of muscovite (mica). Width of sample is 7 cm. Garnet group minerals crystallize in the cubic system – they all show roughly equant dimensions (no elongation). Garnet in rocks may demonstrate beautifully developed crystal faces. They are outstandingly dense minerals for a silicate mineral with such a composition. Their specific gravities range from 3.58 (pyrope) to 4.32 (almandine). This is a result of close packing of the crystal structure which allows garnets to be common minerals deep in the crust and mantle. It is also physically hard, some garnets are even harder than quartz. This property and a lack of cleavage makes it a potentially good abrasive material and garnet is indeed frequently used for that purpose. Rocks that host garnets are relatively good guides that help to identify the specific garnet species. 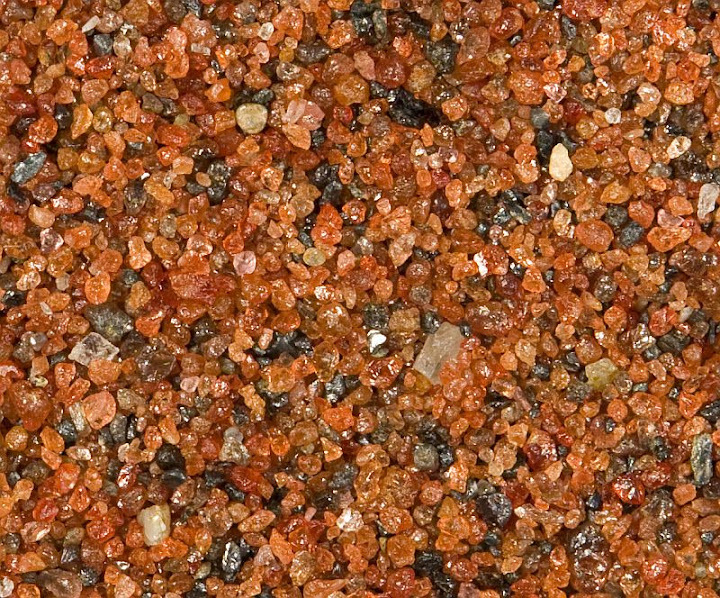 Red equant grains in mica schists belong to iron-rich variety almandine. 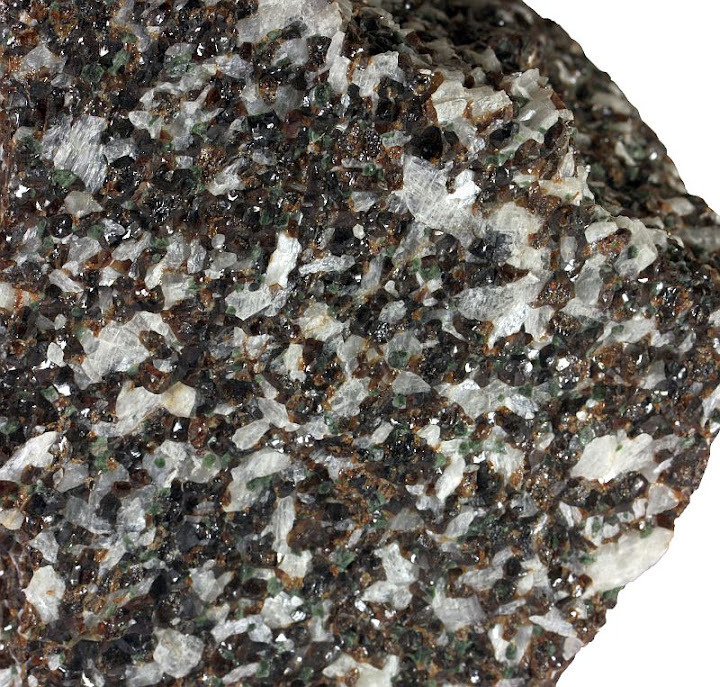 Pyrope is a Mg-rich variety that occurs in (originally) deep-seated rocks like peridotite, kimberlite, eclogite, or serpentinite. 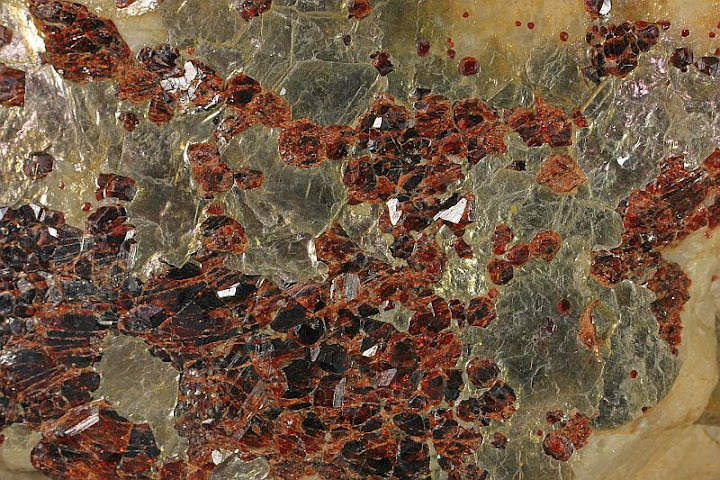 Spessartine, the manganese-rich variety of the pyralspite group, is common in magmatic rocks, especially pegmatite. Ugrandites are typical in metamorphosed calcareous rocks like skarns. This is simplified approach, of course. 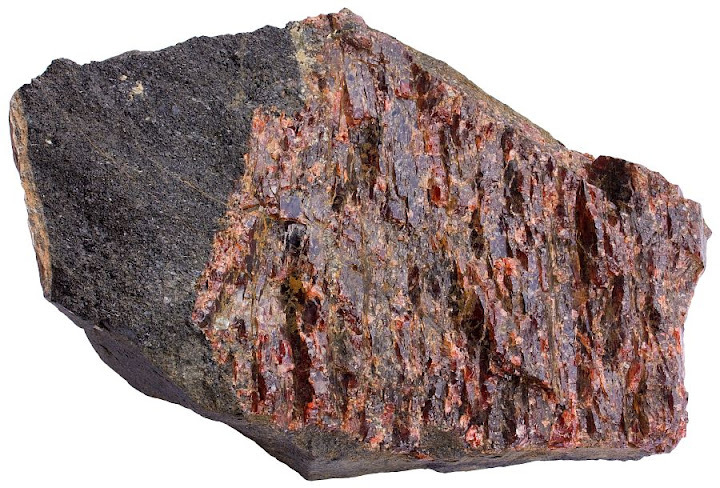 For example: almandine also occurs in igneous rocks, not only metamorphic rocks. And spessartine also occurs in skarns. The color of garnet is primarily controlled by its composition. Pyralspites are either red, orange, purple, or even almost black. Grossular and andradite are yellowish brown to black or green. Uvarovite is bright green. Garnet crystals are beautiful because they are intensely colored and often have nicely developed crystal faces. Garnet is a well-known mineral not only because it is so widespread, but mostly because of its deep red color and beautiful crystal faces which make it a semi-precious gemstone. 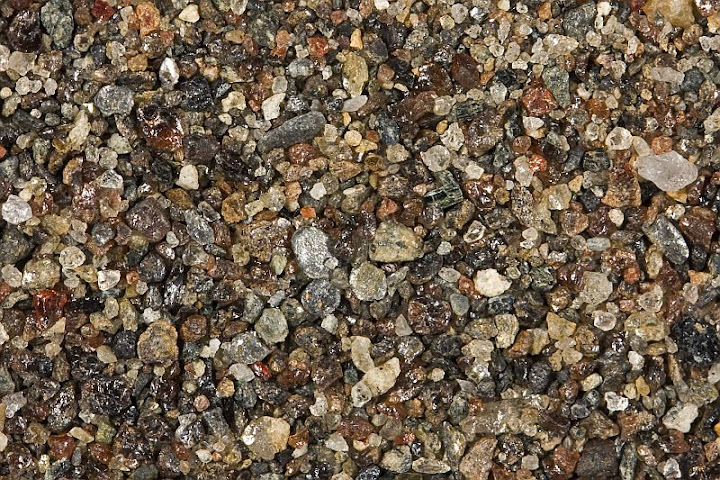 Industrially garnet is mostly used as an abrasive because of its hardness and irregular fracture. It is also used in water purification filters. Garnet is a common mineral in some igneous rocks. Pegmatites may contain beautiful almandine or spessartine crystals. This pegmatite is composed of spessartine, sodic plagioclase, and muscovite crystals. Width of sample 10 cm. Purple Mg-rich pyrope is a common ingredient of ultramafic rocks from the mantle. This sample of peridotite from Åheim, Norway also contains green chromian diopside and yellow olivine. Width of view is about 20 cm. 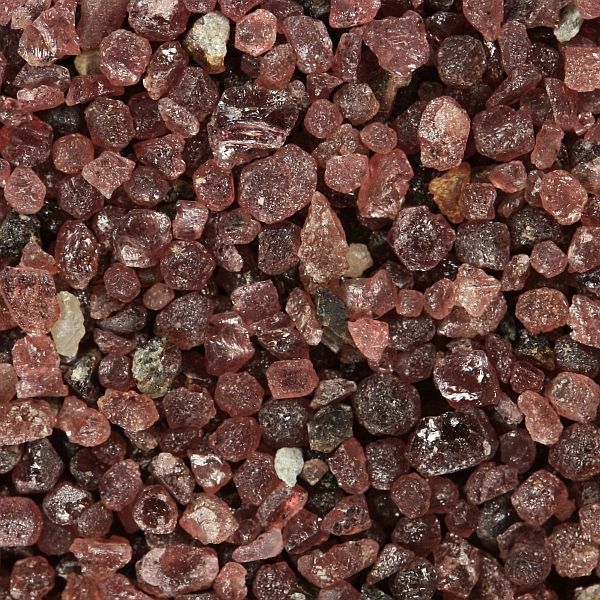 Almandine grains from Emerald Creek, Idaho, USA. Width of view is 15 mm. Andradite (demantoid) crystals. Andradite is not usually green, but demantoid is a green variety of andradite that owes its color to chromium that is partly in place of iron in the crystal lattice. Width of view is 30 mm. 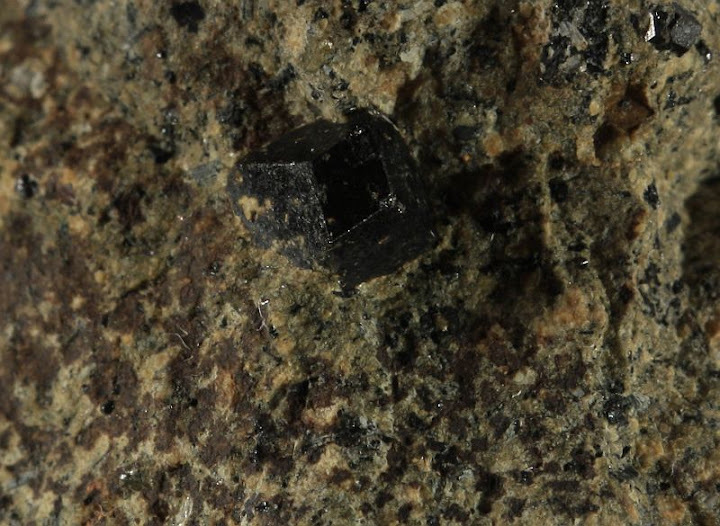 Melanite (Ti-bearing black andradite) in an alkaline igneous rock. Note well-developed crystal faces. Kaiserstuhl, Germany. Width of the large crystal is 4 mm. 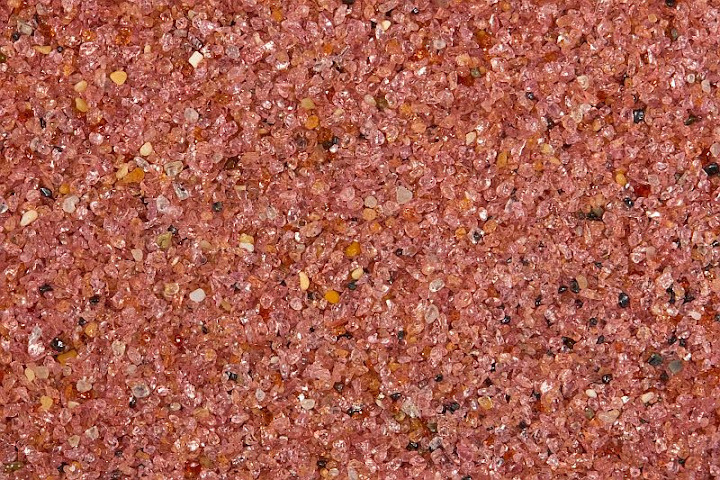 Beach sand from Sri Lanka that contains lots of heavy minerals like almandine (pink) and spinel (dark red). Width of view 20 mm. 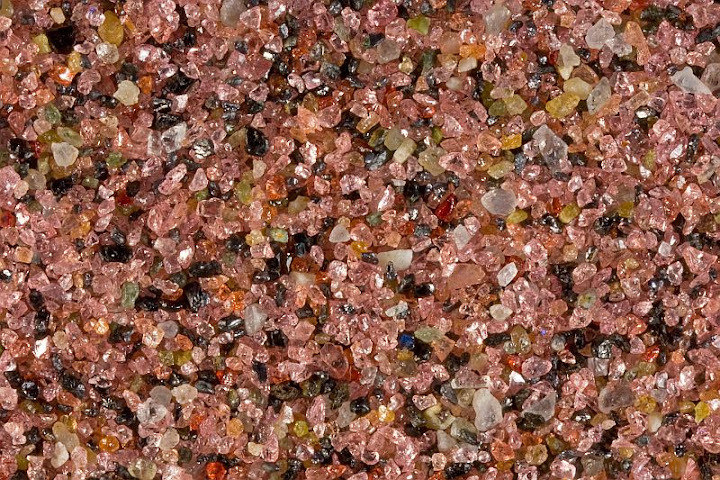 Garnet concentrated from a beach sand in Australia. Garnet is used as an abrasive material. Width of view 20 mm. Garnet-rich fraction of heavy minerals sorted out by running water near the coastline at Pfeiffer Beach, California. A closer look to the Pfeiffer Beach sand. Pink mineral is almandine. Width of view 8 mm. Almandine grains are often present in granitic igneous rocks (S-type or peraluminous granites that have a sedimentary protolith). Width of sample from Estonia is 8 cm. 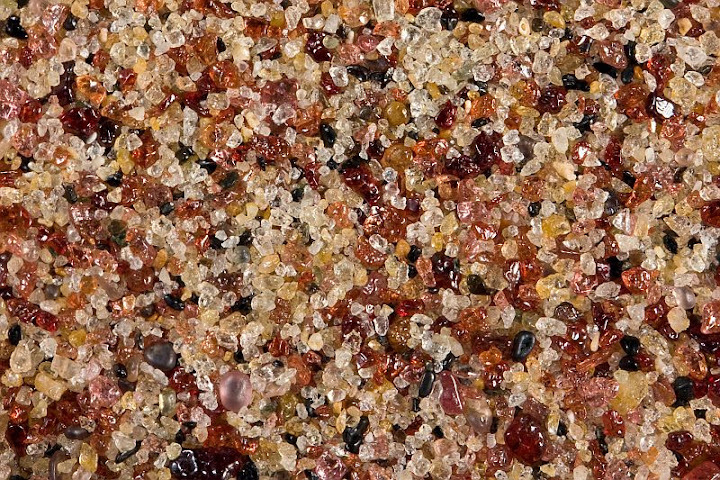 Sometimes garnet crystals are very concentrated in beach sand. This sand sample is from Nome in Alaska which also contains gold. Width of view is 10 mm. This sand sample obviously comes from a weathered metamorphic terrane. 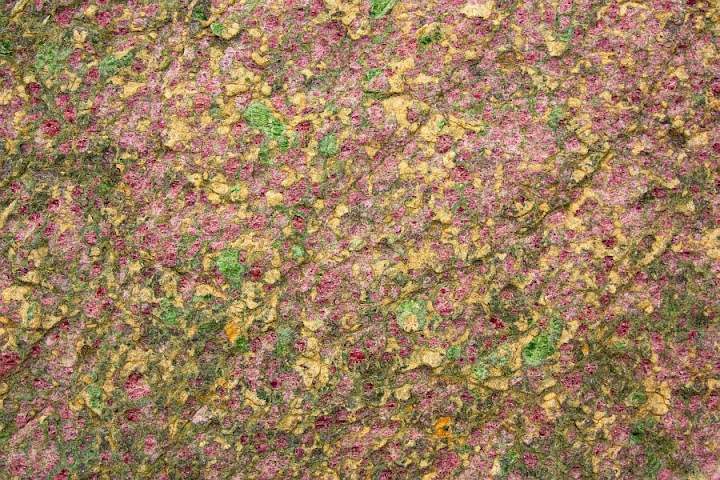 It is composed of schistose lithic fragments, mica, garnet, and plagioclase feldspar, among others. Width of view is 20 mm. 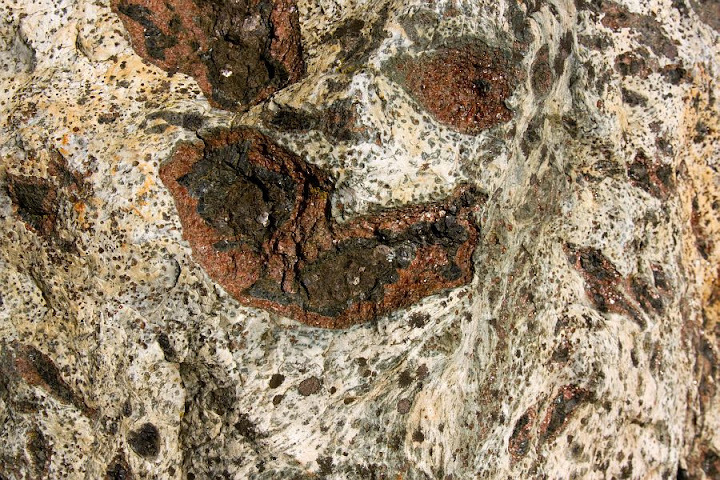 Grossular and andradite (Ca-garnets) are common constituents of calcareous metamorphic rocks like skarn. Skarn is a result of a reaction between magmatic hydrothermal fluids and carbonate rocks. 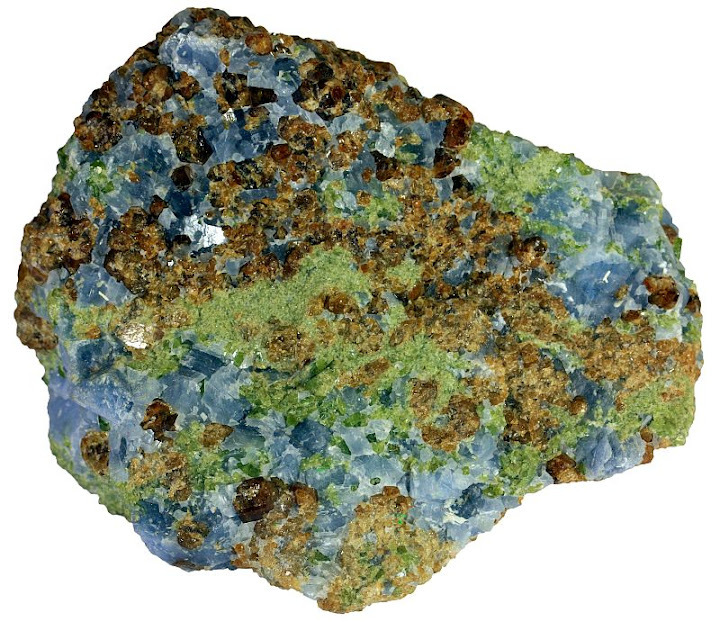 The rock sample is composed of calcite (blue), grossular (brown), and pyroxene (green diopside). Skarns may also contain economical metal-bearing minerals. Mount Monzoni, Northern Italy. Width of sample 6 cm. TUG 1608-4882. Calc-silicate minerals andradite (brown), diopside (green), and wollastonite (white) in a skarn. Width of view 5 cm. TUG 1608-4877. Almandine is a common mineral in aluminous metamorphic rocks. 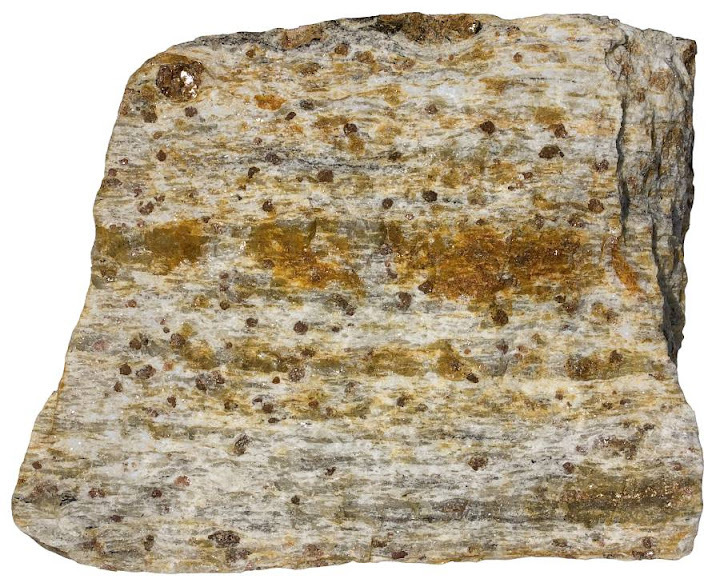 This is a sample of garnet-muscovite schist (mica schist). Narvik, Norway. Width of sample 14 cm. Almandine porphyroblasts in amphibolite from Southern Norway. Width of sample 16 cm. Small garnet porphyroblasts in amphibolite. Senja, Norway. Width of sample 11 cm. Garnet hornblende schist from Switzerland. Width of sample 19 cm. Garnet with magnetite and quartz in a metamorphosed heavy mineral sand deposit. Varanger Peninsula, Barents Sea, Northern Norway. Width of sample 36 cm. Pyrope in a peridotite (wehrlite) with green chromian diopside and yellow olivine. Åheim, Norway. Width of view 25 cm. Garnet crystals stand out because of good resistance to weathering. Olivine (yellow) has lost its original green color. Green mineral is pyroxene (diopside). Width of sample 11 cm. Åheim, Norway. Garnet rims in an anorthositic (plagioclase-rich) coronite with ortho- and clinopyroxene. Width of sample 13 cm. Holsnøy, Norway. Another coronite (anorthositic granulite) from Holsnøy. Garnet rim is surrounding a core of orthopyroxene. White mineral is plagioclase feldspar. Width of view 36 cm. Large crystal in an ultramafic rock peridotite. Hullvann, Norway. Width of sample 18 cm. Lots of garnet crystals (compositionally between almandine and pyrope end-members) in a metamorphic rock eclogite. Holsnøy, Norway. Width of sample 9 cm. 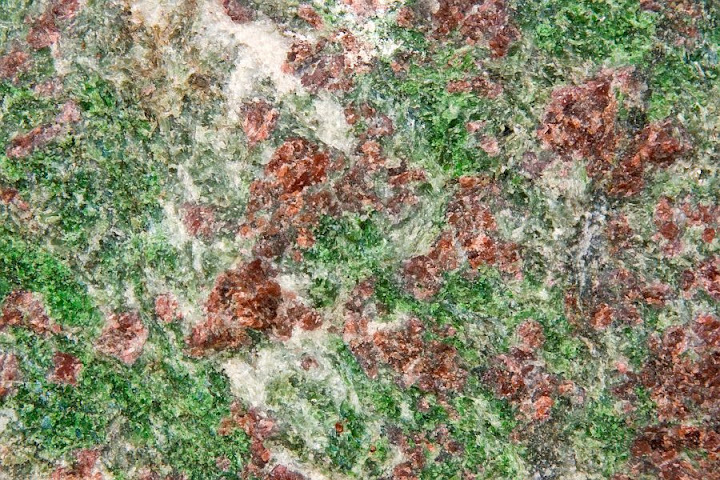 Very fresh-looking eclogite with bright green (omphacite) and red (garnet). Nordfjord, Norway. Width of view 18 cm. 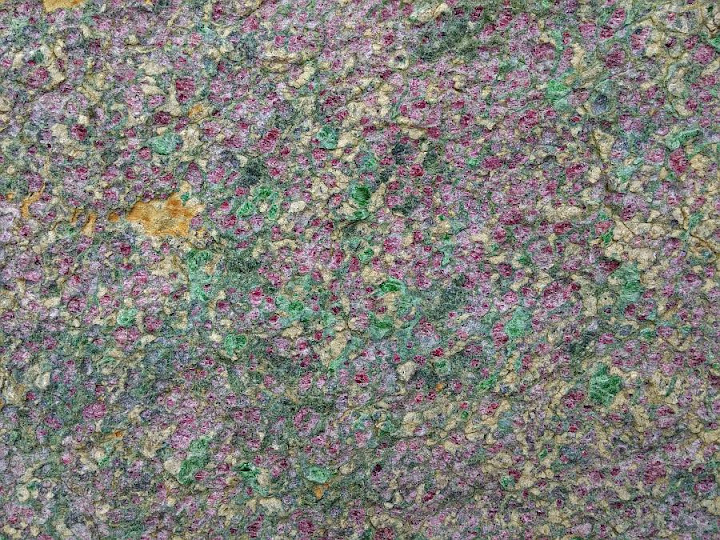 Porphyroblasts in eclogite. Width of sample 12 cm. Nordfjord, Norway. 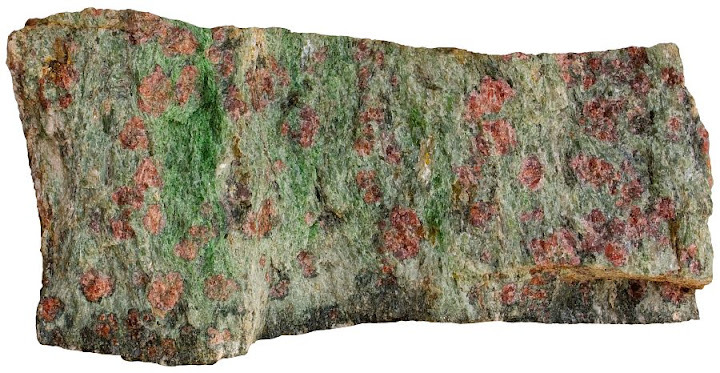 Garnet in eclogite. Width of view 20 cm. Selje, Norway. 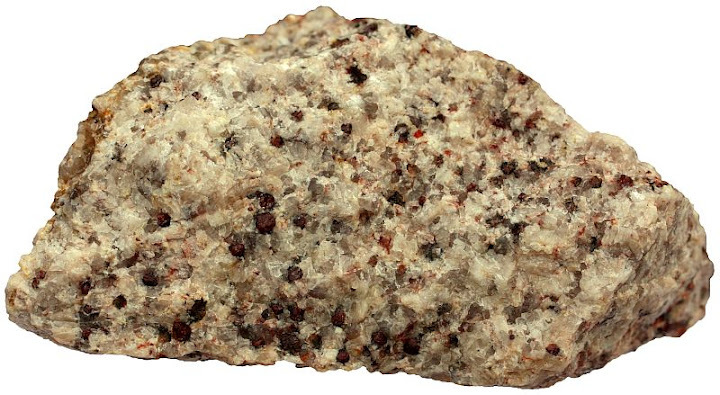 Garnets are common minerals in high-grade metamorphic rocks granulites. Associated minerals are quartz, cordierite and feldspar. Width of sample 12 cm. Tankavaara, Inari Granulite Belt, Finland. Idiomorphic garnet crystals in a pegmatite with very unusual composition: garnet with biotite. Width of sample 13 cm. Senja, Norway. 1. Wood, B. J. (2007). Garnet. In: McGraw Hill Encyclopedia of Science & Technology , 10th Edition. McGraw-Hill. Volume 7. 686-687. 2. Deer, W. A., Howie, R. A. & Zussman, J. (1996). An Introduction to the Rock-Forming Minerals , 2nd Edition. Prentice Hall. I really enjoyed this post. Do you take all of the photos? They are great! Thanks, Dianna! Yes, these are my photos. Wow, wonderful summary of the different garnets. Plus wonderful photos both of the rocks and garnets in situ and loose in sediments. Very helpful. Thank you! This is a fabulous post and wonderful images, well done! I wonder if I may be able to use some of your images with credit referencing for a uni assignment please?